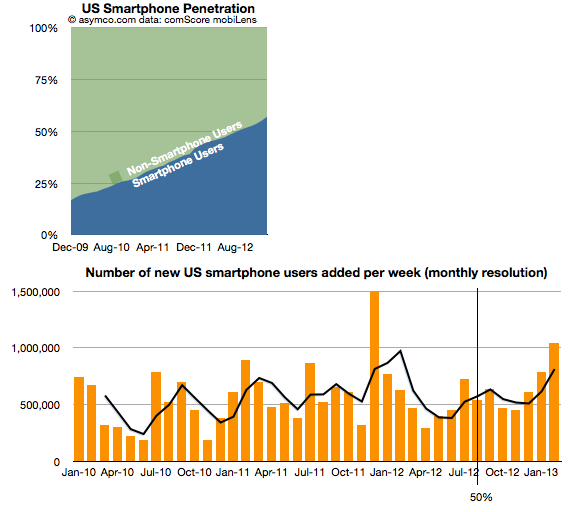 The comScore mobiLens survey for the US ending February 2013 shows continuing rapid expansion of smartphone usage in the US. Even though the 50% penetration threshold was passed seven months earlier, the rate of new smartphone users was second highest ever recorded with over 1 million new-to-smartphones users every week during February. Overall penetration increased to 57% with nearly 2% of the population switching in one month. Using the average growth rate for the last six periods, the US could see 80% penetration in another 19 months or by Q3/Q4 2014. It remains to be seen if the consistency of growth which was preserved from 20% to 60% is maintained between 60% and 80%, but all indications so far are that it will be. The growth in smartphones has been driven by the two dominant platforms: iPhone (iOS) and Android. 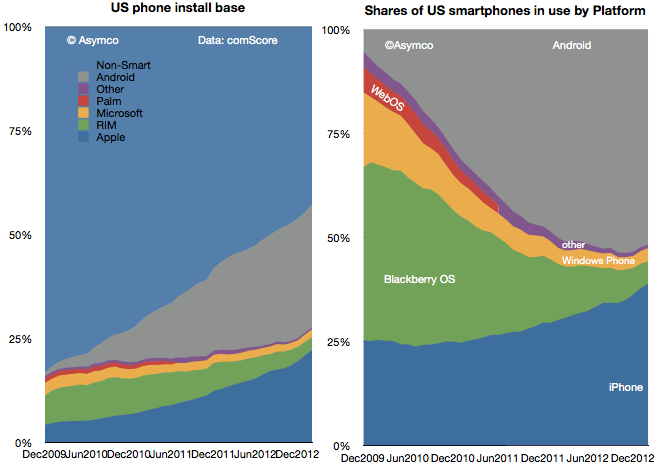 Together they now make up 91% of the user base with about 40% for iPhone and 51% for Android. Android alone gained 17 million users in the last 12 months while iPhone gained 21 million users. 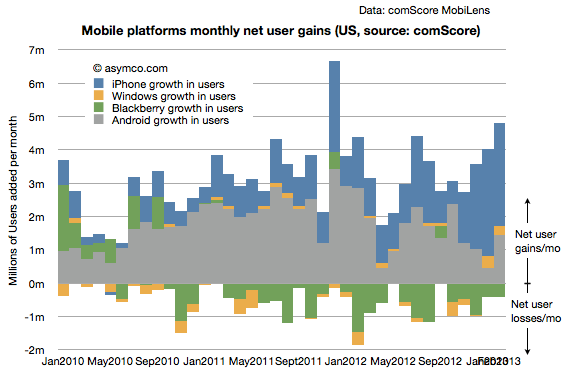 iOS user gains have out-paced Android for the last four periods which resulted in a decrease in Android share of users. A reduction in Android share was also visible in the spring of last year but the current decline is not only longer but more pronounced. Availability of three product variants with $0 starting prices. Increasing awareness and use of apps and content ecosystems due to network effects.